Let’s talk about depression in older adults. You may notice that something is a bit “off” with your older loved one. You can’t quite put your finger on it, but something just isn’t right. It may be depression. Depression is a common issue among older adults; however, it isn’t part of the normal aging process. Clinical Depression is different that the sadness and grief experienced with the loss of a spouse or needing to move from their own home to a new setting such as an assisted living facility or nursing home. If you are concerned about your aging loved one, this list of indicators is provided by The National Institute for Mental Health[i]. Are you or a loved one experiencing any of these symptoms? 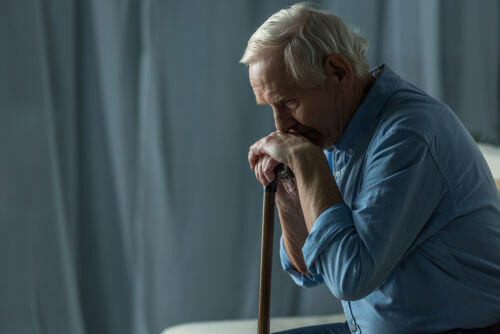 It can be difficult to diagnose depression in older adults because symptoms, such as difficulty with concentration and memory recall, are often interpreted as symptoms of dementia or normal memory loss. Medical conditions such as strokes, heart disease, or cancer, may include depressive symptoms. Some medications that are prescribed for high blood pressure, Parkinson’s Disease, high cholesterol, and seizure disorders also may have side effects which mimic depression. Several treatments are available to address depression in older adults. Psychotherapy (talk therapy), Cognitive Behavioral Therapy (CBT), antidepressant medications have been used effectively to treat depression. A newer form of therapy include rTMS which stands for repetitive transcranial magnetic stimulation. The therapy uses magnets to target and stimulate affected areas of the brain. Care Management can help navigate through the systems involved in caring for the older adult. At arrangeCARE we are available to help with the older adult and family members. We can meet with you and develop a care plan that will focus on relieving the symptoms and causes of depression. We will work in collaboration with Psychiatrists, medical professionals, therapists, and providers of social/recreational opportunities. Throughout the Austin, Texas, area, we use a person-centered approach that places the focus squarely on helping the older adult. Depression can be overwhelming. Let us help!